Create your own horseback riding program at Waredaca! Have fun with horses! Create your own horseback riding experience for any age scout centering around horses and horseback riding and make it happen at Waredaca! Learn as much about horses as possible for all those horse crazy scouts thru our hands-on activities. Programs are professionally designed and geared for all ages…Brownies, Daisys on up. Our most popular options: After receiving a very basic demonstration of mounting, correct positioning and explanation of stopping and turning, our staff will then assist with mounting, adjusting of stirrups, and then all proceed on a pleasant 30-40 minute trailride thru the pastures of our farm. we offer a great, hands on learning event! The participants will first have a discussion of working safely around horses/ ponies. They will then have a demonstration and chance to practice skills just learned. Other skills may be taught as well. It’s lots of fun, offered in a very safe way for this young age group. 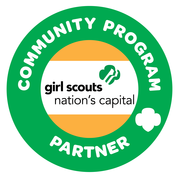 Great bridging program for moving up to Girl Scouts. Please contact our Scout Coordinator Celeste with any questions and to reserve your date at (301) 919-8297 or cgm1223@aol.com. Other days and times may exist, ie school holidays. Give us a call to discuss!